Tags Posts tagged with "new life furniture"
Cincinnati’s only furniture bank is giving new life to those transitioning out of homelessness and out on their own. Keep reading to learn more about how this nonprofit is helping those who need it most. 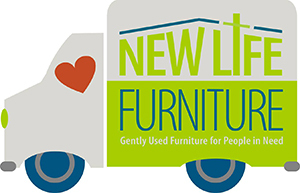 New Life Furniture provides free furniture to those transitioning out of homelessness. Cincy Chic: What is New Life Furniture? Holly Young, Executive Director and Founder of New Life Furniture: New Life Furniture is Cincinnati’s only furniture bank. Cincy Chic: What’s the inspiration behind the furniture bank? Young: We are a faith-based furniture bank and we provide free furniture to folks transitioning out of homeless shelters, many of whom have fled an abusive situation (single moms with children), many veterans who have been sleeping on the sidewalk and many families who have simply found themselves homeless. Cincy Chic: Who’s behind New Life Furniture? Young: The whole community is behind us. We are funded by individuals, nonprofit grants (not state or federal funding), small businesses and churches. We also hold fundraisers to make money. Cincy Chic: When did you launch New Life Furniture? Young: New Life Furniture started as a small ministry out of Milford First United Methodist Church in 2006. We became a 501 (c)3 and moved our operation to Blue Ash for office and warehouse space in 2009. Cincy Chic: Aside from being the only furniture bank in Cincinnati, what makes New Life Furniture unique? Young: In addition to providing free furniture to folks exiting homeless shelters, we deliver and set up for them in their new space (mostly apartments). Cincy Chic: Is there anything new on the horizon for New Life Furniture? Young: Yes, we currently build tables (kitchen, coffee and end tales) to supplement what is donated. We hope to extend that building project into the prison system to build even more as well as adding dressers to that project. Cincy Chic: Where is New Life Furniture located? Young: We’re at 11431 Williamson Road, Unit D, in Cincinnati. Young: Visit www.nlfurniture.org, like us on Facebook and follow us on Twitter. They can also give us a call to set up a tour or volunteer with us by calling 513-313-0530 or emailing info@nlfurniture.org.